A thunderous rumble suddenly breaks the silence on Doug Matheson’s Portsoy farm, as he roars out of the garage on a 1954 Austin Champ. The Army-green vehicle is the Brits’ answer to an iconic all-American Jeep, but in Doug’s eyes, the motor is far superior to anything our US counterpart can offer. During the 1940s it was considered important that a British-made military vehicle was produced in order to reduce reliance on US vehicles and foreign expenditure in general. First produced in 1951, its open-top design was carefully considered to allow it to perform in all areas of combat. Chunky, robust and loud, these trucks were built to last. As the Champ entered service, however, it became apparent that although it had an outstanding cross-country performance, there was one rather serious flaw. “The price,” said Doug, 63. “These cars cost far more than any of their American rivals and, in the end, that was its downfall. “The Land Rover was half the price and could do virtually everything the Champ could. The result was that by the mid-1960s a decision was taken to withdraw the military Champ from service completely, with all such vehicles being sold off by 1968. Although it was a blow for the British car-making industry, for Doug it was a stroke of good fortune. “The very first vehicle I ever bought was an Austin Champ,” he said. “I was about 16 at the time and there was loads of old military stuff around. 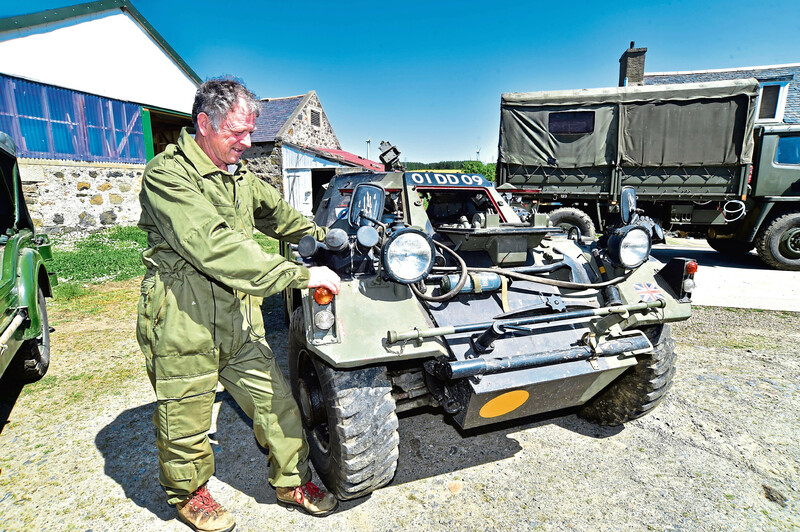 “Farmers and the Forestry Commission were all using ex-Army vehicles so they were cheap to buy, which was exactly what I was after. Fast forward about 50 years, and it looks like Doug has proven his brother wrong, with a garage full of old military vehicles inspired by his original Champ. Although the truck he roars about in now isn’t the same one he had when he was a teenager, Doug has remained partial to the style over the years. “I’ve had this Champ for 12 years now,” he said. “And there have been a few others in various states of repair sitting in my garage in the past. A 1962 four-wheel drive armoured scout car, the Daimler Ferret, leads from the front of the pack. Complete with a Rolls-Royce military engine and full body armour, driving the motor takes a bit of getting used to. “It’s totally different to any sort of normal car,” said Doug. “The steering wheel sits in the middle of the dashboard and is tilted towards you in order to work around the armour. “It’s extremely noisy and hard to see out as all you’ve got to look through is small hatches. Bringing the firepower is a 1980 Sultan command vehicle, fitted out with its very own machine gun turret. “It’s only done 122 miles,” said Doug. “Again it was very expensive for the Army to buy and run so it wasn’t particularly popular in its day. “I got this one from a tank museum in Dorset after we arranged a swap. Currently self-employed, Doug spends his working week restoring old vehicles, a profession which has come in handy considering his hobby. A current personal project is the conversion of a 1992 Layland DAF truck from an Army transporter to a holiday campervan. In comparison to his other motors, the DAF truck is relatively modern with heaters and power steering as standard. It may not be the oldest in his collection but the DAF is special to Doug. 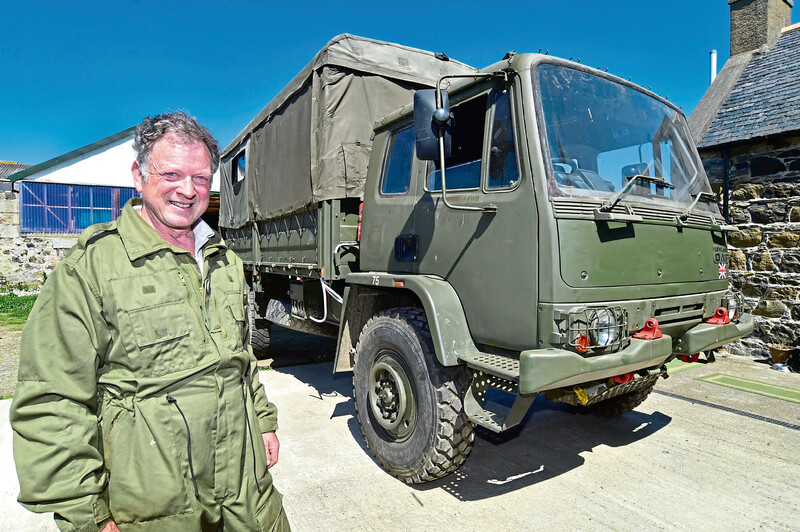 “It was the very last four-ton truck that the British Army ever made,” he said. 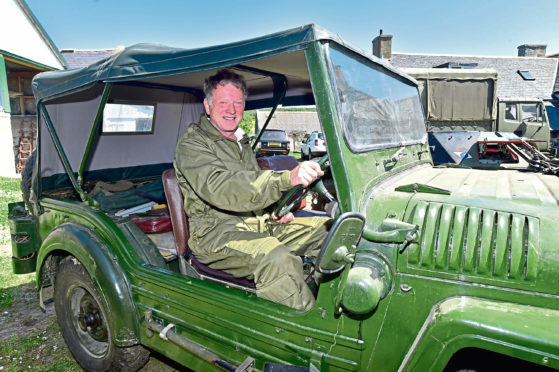 Keen to show off his fascinating collection, Doug is preparing to display his vehicles this weekend at the Grampian Transport Museum’s Military Vehicle Tattoo. With historic military hardware from all generations, rides, demonstrations and period displays, the one-off event is set to be a wonderfully quirky day out. “I’m going to be doing a display on ammunition and how to protect against chemical attacks,” said Doug. In the meantime, Doug is busy getting his vehicles ready for the event, and if anyone is looking to wage war on Portsoy, I’d think again – it’s pretty well defended. 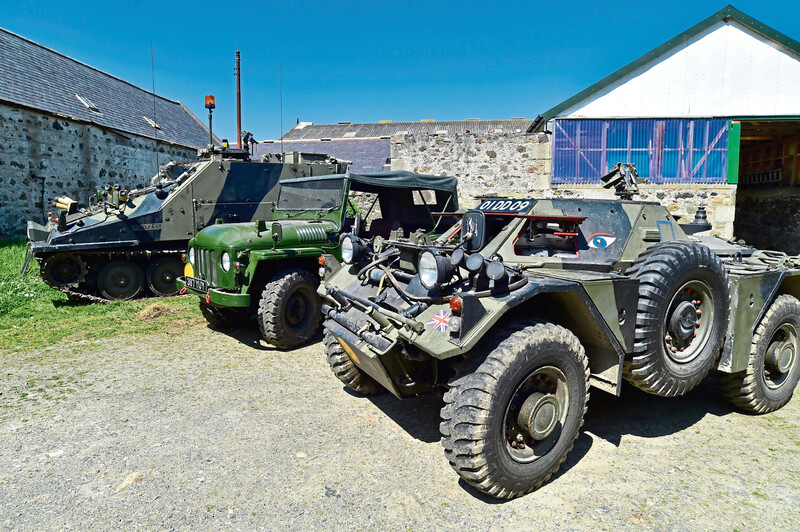 The Military Vehicle Tattoo at the Grampian Transport Museum in Alford is taking place on Sunday between 11.30am and 4pm. Is this the best Saab in Scotland?